I can almost SEE home from here!!!!! I have never been so excited to go home. Not that I didn't love this trip, but once we were done with the sightseeing the trip just became a quest to get back to good ole 16301. And, after FOUR nights.....we are almost there! After Yellowstone, we made our way into eastern Wyoming. We started to find we were getting out of the mountains and back into the plains. Our next stop in the booming town of Sundance WY, was merely a place to rest for the night. But it had a pool, and amazing bathrooms, and free pool tables! So the kids were PSYCHED. But, I have to mention, that day was also a big milestone as my little sweet Caroline turned 13 that day!!! Yes, my "she will never survive birth, one year etc etc etc, blah blah blah, yada yada yada...is a TEENAGER!!!!!! And seriously - doesn't she look like a teen here? I have to also say - Caroline did AMAZINGLY well this trip!!!!!! The main reason we even bought this huge motorhome was so we could travel with her, and it worked out so well. She was quiet and happy the entire trip. She slept well, was smiling all the time, and was even easy on [most] of our day trips. We were so pleased with how easy traveling with her was that we have been planning many MANY more trips with her for the future!!! After we left Wyoming, we drove through South Dakota so we can see Mount Rushmore. This was one of those things that we knew we had to see, but really had no intention of spending much time at. As an aside, as we were driving along I90, we noticed some smoke and actually saw a forest fire in action! I googled it and apparently (at the time) it had encompassed about 1000 acres and was not contained yet. I haven't checked in for an update, but it is a bit scary considering the damage from fires we have already seen. Mount Rushmore is very cool to see, but, personally, I can't see spending a whole lot of time there. It sort of reminds me of Niagara Falls. There is a lot of STUFF around the area - shops, restaurants, zip lines, wax museums - but the actual attraction is something you can see for a couple hours [if that] and then move on. We had planned on taking some time to see the Badlands, but after many many miles, and many many stops, we were pretty much done with sightseeing. We did see some peeks at the Badlands from the road, and maybe will stop on another trip when we are less eager to be home. After Mount Rushmore, we continued on across South Dakota. I have always wanted to see this part of the world - especially considering Laura Ingalls was such a big part of my life as a munchkin! It is a beautiful part of the world - so peaceful. We stopped for the night in western South Dakota. I have spent a TON of time researching campgrounds on this trip, and I really do try to find something nice, even if it is only for one night. After a long day of driving, the kids do love to at least stop somewhere that they can run and explore and have fun. And our spot that night was right along the Missouri River. We built a fire, roasted marshmallows and enjoyed the amazing sunset. I was even able to get some fun silhouette shots of all the kids [sans Caroline] along the river. I LOVED these shots - and so did the kids!!! Of course, the light was fading and they were all so eager to get "JUST ONE MORE!!!!!!" But they still were so fun. And so we have made our way through South Dakota, Iowa, Illinois and now we sit in Indiana. We are SO CLOSE to home we can almost see it. Tomorrow, we hope, we will be home [and in our own beds!!!!] again. At this point, we just want to be home. Our laundry is overflowing (and now shoved into storage compartments under the rig) and there is no way I want to spend another $15 in quarters to get it done. Our groceries are almost gone and I have no inclination to stop to replenish. And my gumption and motivation to keep this little motorhome neat and clean was left somewhere in South Dakota. This has probably been one of the best experiences of my life. We have done so much, met so many different types of people, and it is going to take a while to fully appreciate it all. "Life is short, and money is replaceable.". And we are in the home stretch....meaning we have a looonnnnggg stretch of driving before we can see home again! I can't believe how far we have gone and how many campgrounds we have stayed at! Our last stop was in Livingston, Montana. I just LOVE Montana. It was so funny but when we crossed the border, it really did seem like the skies just got bigger. Our next campground was located in LIvingston, MT. A little town north of Yellowstone National Park. 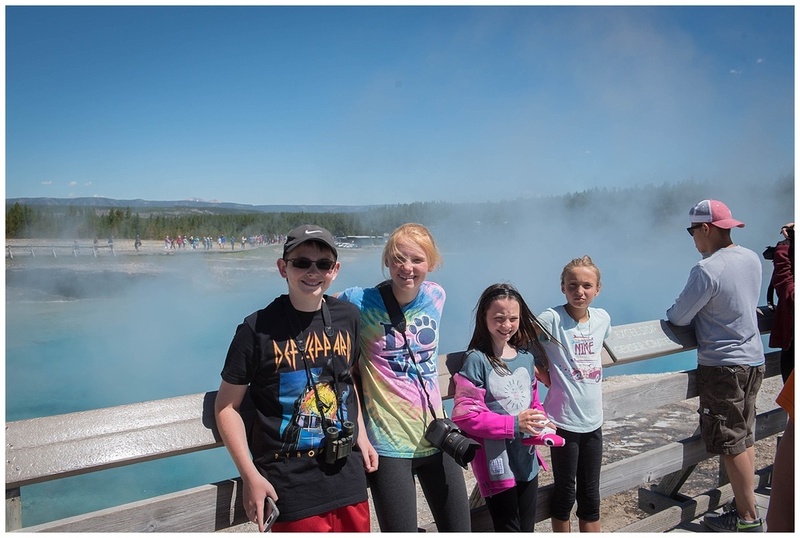 Our plan was to camp for 4 days and spend two days touring Yellowstone. 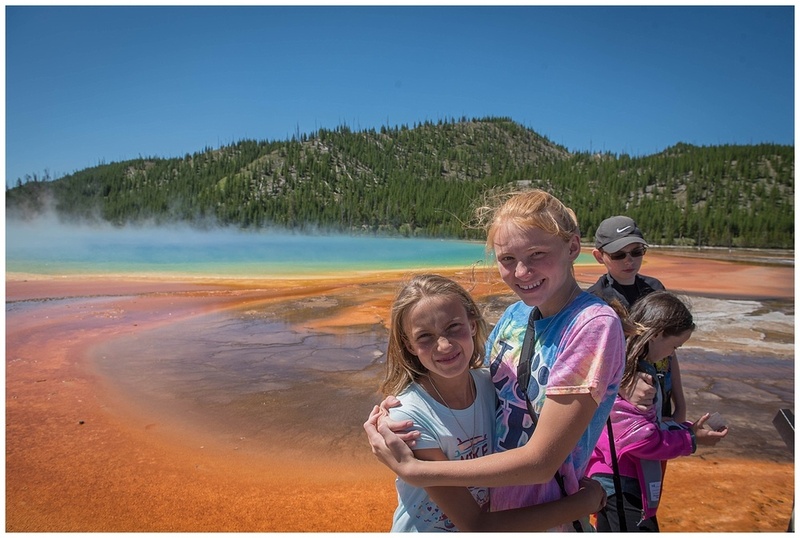 I knew that was a not even CLOSE to enough time in the park, since the park is 2.2 MILLION acres, but we are all starting to get the itch to get home and if we took our time around the park, we would be extending our trip more than we wanted. Our campground in Livingston was 30 miles from the north entrance of Yellowstone. It was a really nice campground right alone the Yellowstone River. We had a few little hiccups such as arriving with 40 mph wind gusts which made us feel like we were going to flip right over. Luckily the winds died down in a couple hours and we were in awe of the sunset view from our site! And since we made last minute reservations, we didn't have the best sites of the park and we weren't able to get a river view. But the staff was so nice and the kiddos were VERY excited to hear that they have ice cream socials on Sunday nights....that means ALL YOU CAN EAT ICE CREAM! On day one we got up bright and early for a Saturday in Yellowstone. Which is not an easy feat with all 8 of us, including one Caroline and one puppy who was staying back and needed some quick morning exercise. We headed in and first saw Mammoth Hot Springs. It definitely was "mammoth". And my kids are definitely "difficult". We then made our way around the upper loop. The vistas and scenery are so beautiful!!! Our next big stop was the Yellowstone Grand Canyon. That was so beautiful and definitely worth the hike down by the lower falls. We then stopped at Inspiration Point (not not circa 1956 Happy Days..) but just a beautiful overlook where we happened upon a group of students from Gannon University! My alma mater!! The instructor was a biology teacher and he was very eager to give us lots of suggestions on where in the park to see specific wildlife, including wolves and bears. But he also suggested a 6 a.m. arrival which was pretty much not an option with our group. But it was nice chatting and definitely makes you realize what a small world this is! The other interesting thing we found that day was the evidence of the forest fires. Wow. We have seen this in many locations throughout our trip and it is always amazing. And there was even still snow on the ground! The next day was a day to stay put and relax and take care of business - like laundry and sitting riverside. And letting the puppy get just a tad dirty. It was a much needed day but it wasn't nearly enough. At this point I really am starting to feel exhausted. I do love everything we did and everything we saw, but wonder if a shorter trip with a few less stops may have been a little easier. But we were up early again, dropped off Dixie at a local kennel so she wouldn't be home alone all day again, and we were back for the lower loop in Yellowstone. Unfortunately, since we stayed north of Yellowstone, we had to go back over areas we already saw in order to reach the lower loop. I knew that was the case, but definitely envied those who camp in a more central location so they had less driving and more time to enjoy the sights. 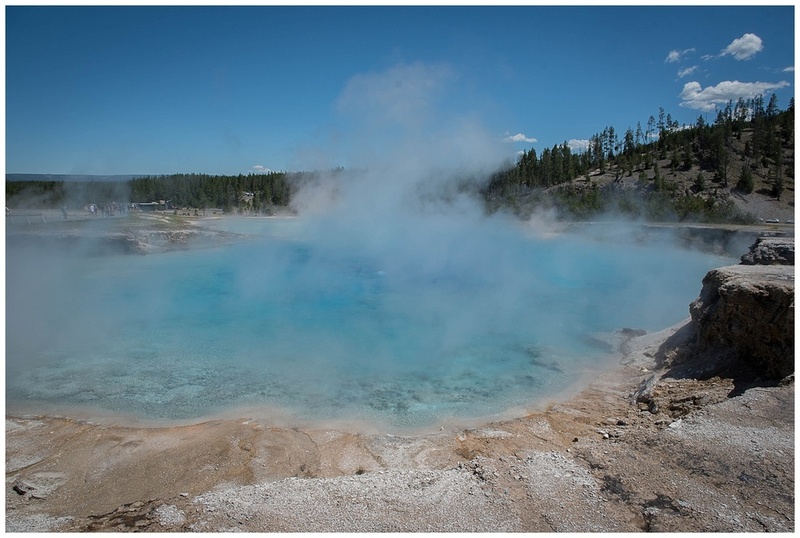 The western side of Yellowstone is where all the geysers and hot springs are. They are SO beautiful. I could not take enough pictures trying to capture the amazing colors. Caroline, wasn't exactly excited by any of it. And then it was time for Old Faithful. We arrived about an hour before the next "scheduled" eruption. Just in time to have a little lunch and relax before getting a seat for the "show". An interesting note...we were listening to a park ranger give a talk about Old Faithful when an oriental woman started walking off the walkway and onto Old Faithful for a picture. The ranger said "excuse me" and then turned and started talking Chinese (I think) to the lady to tell her to get back on the walk. I never would realize that rangers would be multilingual but I guess it makes sense consider the huge variety of of visitors to these parks! Old Faithful was as amazing as we expected. The kiddos had a front row seat. And I was amazed at the HUGE mass of people who are present for the eruptions! We then made our way through the rest of the park where we saw a bagillion bison - and even saw a bunch RUN down a hill and jump in a stream and swim across. There were also a ton of elk - many many with babies. 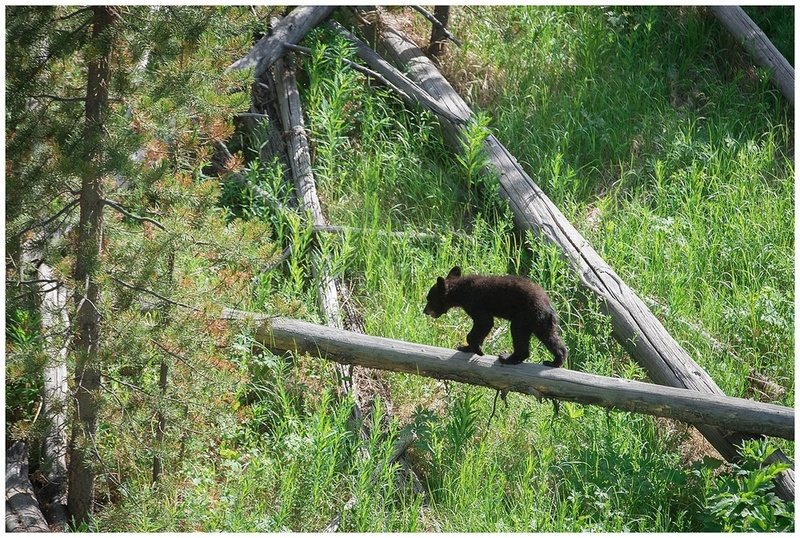 And we even saw (from our car) a mama bear and her cubs! The bears held up traffic a bit, but it was worth it. Yellowstone was way more amazing that I actually expected. It is HUGE. There is such a variety of things to see. And you truly do need at least a week to see it all. I so wish we had time to just SIT and relax and take in all the sights versus the go-go-go-go schedule we ended up with. But hopefully we will be back! Soon! (???). One thing I REALLY don't like about this entire trip is the fact that when google maps says it will take about 3 hours to arrive in our destination, in actuality, our motorhome/trailer convoy will probably arrive in about 5-6 hours. We are slow going, but we are STILL going! Well we are on day #19 (or 20?) and we are leaving the beautiful state of Idaho and heading into Montana. I am UBER excited for Montana as it is a state I have always wanted to see. I am not sure exactly why, but it just seems like a quiet and beautiful place to be. It also doesn't seem to be as popular as states and parks in Colorado and Utah, and I definitely much prefer quiet and peacefulness. It also may have to do with the fact that I also absolutely loved the movie The Horse Whisperer which was filmed in southern Montana and thought that the location looked heavenly. But first back to idaho. Since we have had pretty much NO plan and NO reservations during this trip, we have been finding campgrounds on the fly. That has worked out pretty well, but when we are traveling into areas that are popular destinations, we are finding we have to camp a ways a way and take longer day trips to our final destination. So our first plan in Idaho was to take a day trip to the Grand Tetons. Grand Teton National Park was about 90 miles from our campground. It was a little bit of a drive, but it was definitely a beautiful drive! I never realized how gorgeous the Idaho countryside is! And then we started making our way through the Teton pass and into the Jackson Hole area. With long 10% grades, and very windy roads, I can't imagine driving through there with an RV (and we definitely saw many doing just that!). The entire area of Jackson Hole, Teton Village and Grand Teton National Park is one of the most beautiful areas I have ever seen. I think we were really starting to regret our aggressive trip schedule and wish that we could have spent a week right there. The views were absolutely spectacular. And we all SO wished we had our kayaks and lots of time to just sit and relax and enjoy the area. Again - I just could NOT stop taking pictures!!!! 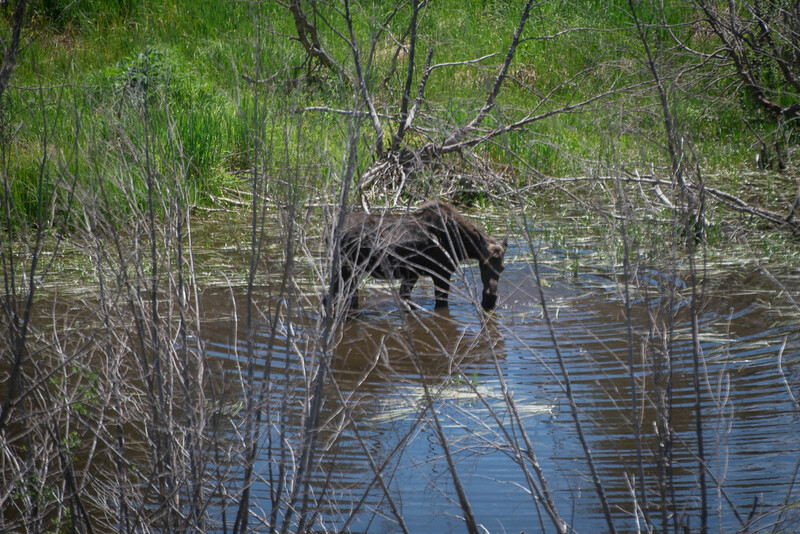 We saw a mama moose and her (about) 3 week old baby. We saw lots of bison. And we saw snow capped mountains with crystal lakes. The photographer in me REALLY wished I could be there early in the day or late in the evening to really capture those vistas in perfect lighting. After a day of exploring the park as much as we could, we made our way into Jackson Hole for some dinner. It was, again, a disappointment that we didn't have much time so we couldn't walk around and explore as much as we would have liked. So we settled for dinner, a quick walk around a few blocks, and then another 90 mile drive back through the pass and onto the campground. The next day was a day off and my youngest's birthday. She wanted bagels at Panera Bread so we took her out for lunch, did a little shopping and spent the rest of the day poolside. I have to say, the kids are REALLY having a blast. Of course, being in small quarters and being a bit sleep deprived after late nights and early mornings and LOTSO activity in between, you can expect the occasional squabble. But all in all, it has been a fairly peaceful and very fun trip. The kids love all the sights, but they also really love downtime and poolside days. And we have been getting a good mix of both. So we are heading into what we think is our last week on the road. We plan to stay in Montana for a little while and go into Yellowstone this weekend. After that we are thinking maybe Mount Rushmore and then a trek home. "Mom? Are we going to be broke when get home?" HAHA! No, not quite. But we will probably be a lot more frugal for a while and spend a lot more time sitting at home over the next few months. One other personal observation - I am NOT going to miss all the storage door, slideouts and ledges on this rig.....I can not tell you how many times I have cracked my head....HARD...during this trip. I think I have three good goose eggs right now and will be surprised if I don't come home with a full blown concussion. Well we are more than halfway through this adventure! It has been sort of odd - after about 5 days of traveling I felt a bit homesick. But now that we are on day (16?) I feel actually less eager to get home. I have always been a bit of a homebody. And I still am a bit. But I am definitely starting to really get why so many people find the RV lifestyle so appealing. I love having my "home" with me all the time. I love that it takes about an hour to do a complete clean. And I love that I open my door to completely new views and landscapes any time I want! But here is our travel loop - with all our stops - so far - and WOW! I can't believe we have been so far!!! So the last time I checked in we were leaving southern Utah. Wow. That place it H.O.T. I did find so much of so beautiful. But if it definitely not a place I would want to make a permanent homestead. I guess I just don't find a location appealing that A/C is almost an absolute necessity to survive. And when daytime temps are almost 120 and it has lows STILL in the triple digits? After leaving Hurricane Utah, we had a really simple and easy trip up to Salt Lake City, Utah. The only real reason for that location was that it was a large city and we had a generator that wasn't working well. And SLC had an RV dealer that was willing to look at our rig on Monday morning. So off we went! We stayed at a KOA. It was actually our first KOA of the trip. I can see the appeal of the KOA, as the kids did love having a pool and a ton of other kids around. But I can also see why some people avoid them. They are quite the happening place and the pool was a veritable aquatic version of Chuck E Cheese all day and night. It was fun for the kids but I spent a lot of time swearing that some major kid-injuries were going to happen at any moment. The full day we were there we took in the rig to Legacy RV. I have to mention their name because they were AWESOME. They spent some time looking over our generator and actually weren't even able to duplicate the problem (of course). But they made an educated guess that it probably was the fuel pump. They ended up replacing the pump and our original dealer in Northeast (Wakley RV - who also deserves a HUGE shout out for being amazing) agreed to pay for the whole thing. The next day we packed up and headed into Idaho. And we are currently spending a few days in Idaho Falls. We have to say, the weather is AMAZINGLY better here with temps in the 80s at night and 50s (and COLDER - 40s??) at night! Such a nice chance from the crazy southwest. 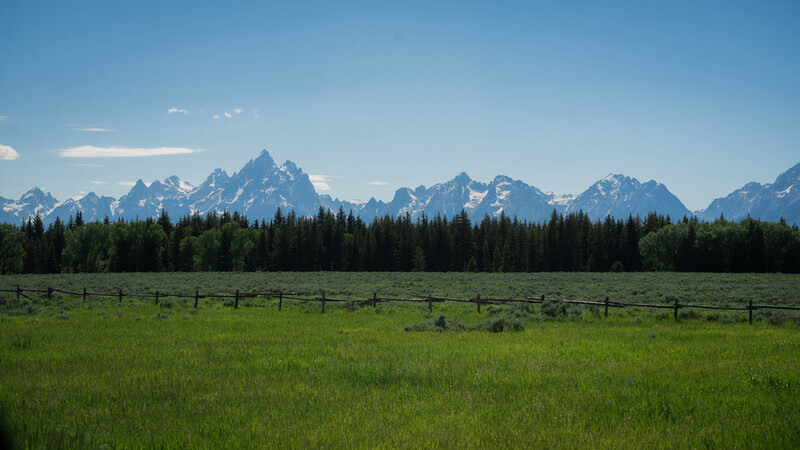 Tomorrow we hope to tour the Grand Tetons before making our way north and seeing Big Sky Country....a.k.a. 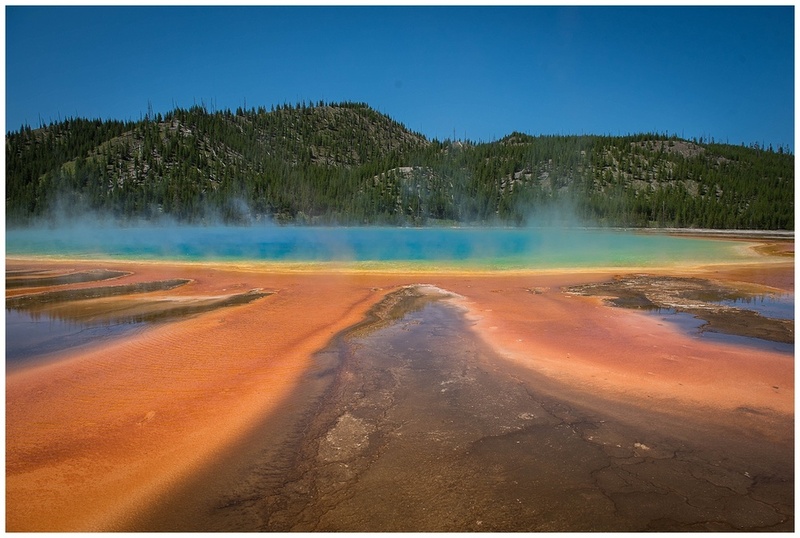 the state of Montana and spending some time in Yellowstone. We can not WAIT to see that park and all the wildlife!!! It is crazy to think that we are also now starting to plan our trek home. And it is very crazy to think that that fact we are going home is making feel a tad sad. I always thought I would be more than anxious to get back to the homestead. And while I really am, it is definitely tinged with a bit of sadness that this trip that was planned for MONTHS AND MONTHS, is coming to an end. And we are also starting to even talk about "where should we go next year???" Baby it is getting HOT! So we are on day #....um....13? I honestly have little idea. It is crazy how such a long and varied trip has completely made me lose all concept of what day it is and what the date is! We are currently in southern Utah. And HOLY COW. It is about a 100 now....but tomorrow is supposed to be about 108...and then 114...and then 118! And with 3 kids (one of which is Caroline) and one dog AND one A/C that doesn't work while driving (thank GOD it works great while hooked up), we are a little scared about the pending heat wave. So we decided to high tail it outta here and head north sooner than planned. Thank GOD the campground we were booked at was so gracious to refund us for the "nonrefundable" days we aren't staying. But, I digress.....and onto a trip recap before I forget all the details! So we finished our stay in the state of Colorado at beautiful Lake Vallecito. We stayed at a great little wooded campground where we were able to get campsites right next to each other and where the kids could ride bikes and explore. It was really nice. On the the first day, we took it slow in the morning and then headed into Durango after lunch. Our first stop was the historic Durango-Silverton railroad station where we emptied our wallets and decided to book a day trip on the train for the next day. The next morning we literally played out a scene from Home Alone. No, we didn't accidentally forget a kid, but we did have an alarm malfunction and literally had about 15 minutes of time to get up and get 5 of us ready - and one dog walked - and get on our way to the train. We were a little disheveled and a LOT stressed...but we made it!!! The train left about 8:45 and was 3 1/2 hours each way. It is the oldest steam engine in continual operation and has been running since 1881. We meandered through town and then slowly started our way up the mountain into Sliverton. There were breathtaking views the entire ride, especially when we rode on the edge of the mountain and were looking 400 feet down into a gorge with the Animas River rushing below!!! Caroline did fairly well but got a little tired of the noise, or the swaying, or the sitting or or or.....(who knows!!!???) and she spent the last hour off and on crying until we arrived at Silverton. Silverton is an old mining town that almost makes you feel like you walked back into time. We had lunch and then a little over an hour of time to walk around and explore before our 3 pm train took off back to Durango. And luckily, Caroline seemed to enjoy the ride back down the mountain much more than she did the ride up. As an aside, our little pup Dixie was left in our RV during our LOOONNNGGGG day and we were really nervous about how she would do. But other than missing us a LOT, she was fine! She really has been doing so well during this crazy adventure! The next day we packed up again and made our way southwest. And the landscape quickly changed from lush and cool and beautiful....to arid and sandy and HOT. We passed the four corners monument and jumped out for a quick picture. Actually it wasn't that "quick' because we first had to pay $5 per person and then we had to stand in line for our chance to take "ONLY THREE" pictures. Luckily it was a midweek so the line wasn't too long, but I can see it being a long stop during busy times. And even though it was sort of "cool" to be there, I wouldn't necessarily recommend going out of your way to make the stop. And then we continued to make our way west across desolate northern Arizona. UGH. It was in the 90's and our A/C doesn't work in the motorhome for longer than 10 minutes at a time....and we entered a pocket of no cell service, no NOTHING. It was really not fun in any way. At about dinnertime we arrived at Lake Powell Arizona. It was a beautiful area but very hot, still no cell service and the wifi at the campground was almost nonexistent. No cell or wifi normally wouldn't be a huge deal at all but we had a few problems. First off we have been watching the weather and the forecast of "deadly heat" in our area over the next week started to really scare us considering #1, we have a handicapped child and #2, our A/C issue is going to make any travel insanely uncomfortable. And then, to top it off, we have an engine issue, our sink started leaking like crazy and our toilet clogged. Now being RV newbies, these issues become BIG problems because we have no way to do any research on our options and possible fixes. So we hightailed it to a local McDonalds where we could use wifi and start to make some alternative plans. We all finally decided that we needed to cut out stay in the southwest short and start going north sooner rather than later. It is a bummer because we aren't going to be able to see as much of southern Utah as we wanted. And we aren't going to get any [much needed] days to relax. But with temperatures forecasted to be about 118? We would rather get moving. After a couple nights we got up early and went east to Hurricane Utah - the place we planned a long stay but decided to cut to only 2 days. 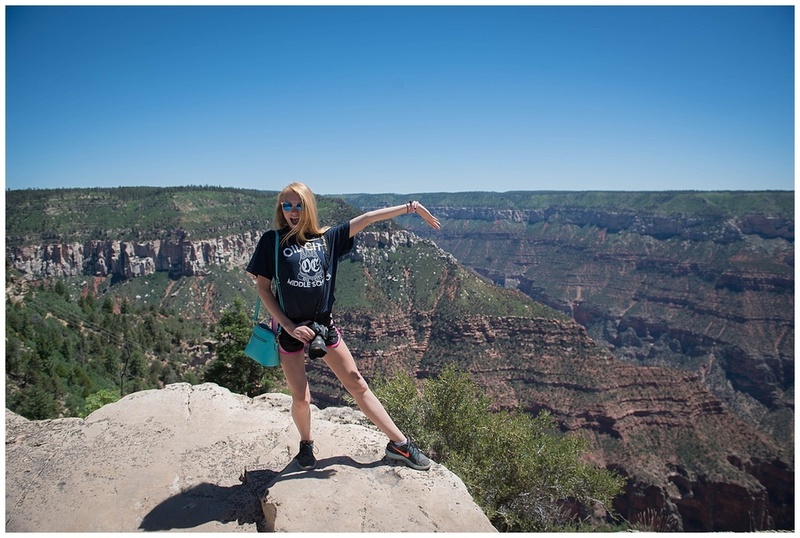 On the way though, we made a detour and stopped at the Grand Canyon North Rim. And all I can say is WOW. I have heard countless times before that you have to see the Grand Canyon in person to truly appreciate it and by golly - they were right!! It is truly breathtaking - like you literally catch your breath when you see it. 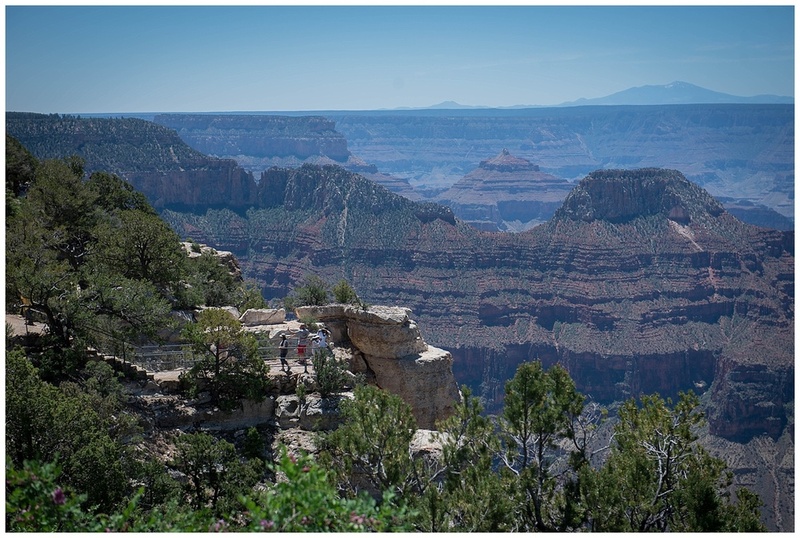 The only "person" who really didn't appreciate, or even care for, the Grand Canyon was Dixie. She was so scared and barked a lot. We felt bad but there was nothing we could do - either take her with us, or just don't go at all. And then we arrived in Hurricane UT. The RV park was probably one of the nicest so far. The staff was so sweet, the spots were perfect and their bathrooms are amazing - better than mine at home actually! And they had a handicapped shower which was huge and had a seat and was perfect for Caroline. We only wish the weather would have cooperated as this definitely a place we could have stayed for a while. 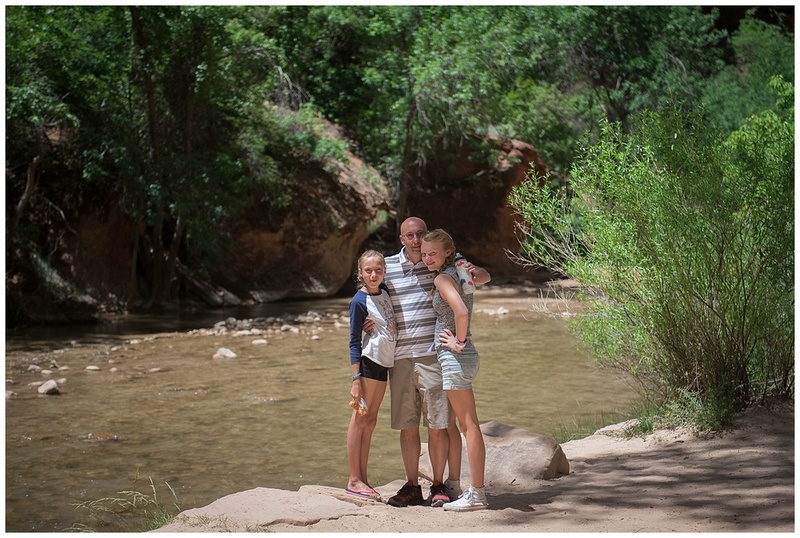 The next day we made our way to Zion National Park - about 25 miles from the campground. Unfortunately though - it was Saturday so it was CROWDED. And we had no idea where to go and what to do so we made our way to the information desk for guidance. I can not say enough about Zion and the way they immediately made it SO easy for us to visit with Caroline. The only way to access most of Zion's points of interest in by a shuttle. But since it was Saturday, the line to the shuttle was seemingly MILES long. The ranger said, however, he can give us a pass for our car so we can drive into all the areas that are restricted only to the shuttle. It was like we were VIPs! We had Stacia and the kids pile into our car - since we actually had enough room! - and we drove around the park. 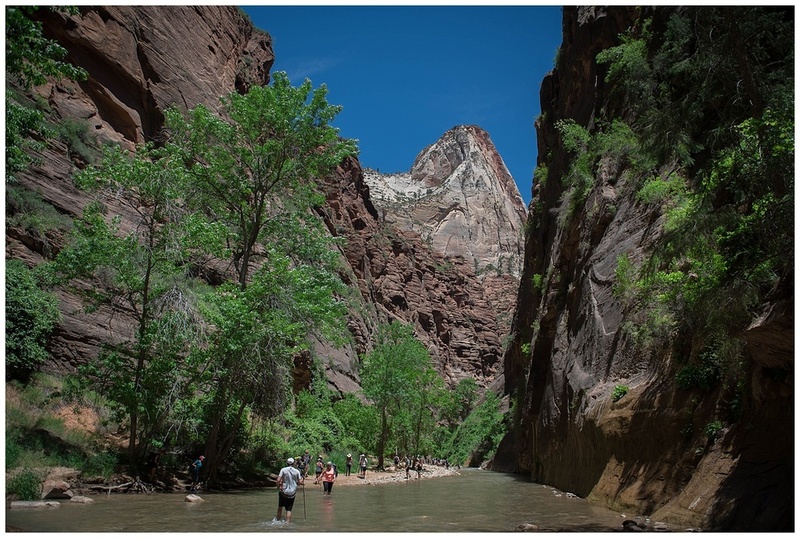 This park is just gorgeous - HUGE towering red rocks, lots of trees and the river winding its way through. I felt like I couldn't take enough pictures. We stopped at the end of the road which is where the hiking path to the Narrows is. After a little lunch, we made our way along the path to the Narrows. Luckily the path is also easy for strollers or wheelchairs so we were able to make our way with Caroline! But, unluckily, we made the poor decision to leave our water bottles and NOT bring bathing suits. It was HOT. It was about a mile walk one way. And they had STUNNING swimming holes!!!!!!! By the time we got to the end, the kids gave up caring if they got their clothes wet and just jumped in. But we were way too tired and thirsty to stay as long as we would have liked, so we headed back. I wish I could say "next time" we will do it right, but who knows if there will ever be a next time. So now we are heading north and hoping to escape the worst of the heat. We are also scheduled to get some service done to our RV in hopes of getting the A/C working and possibly getting our engine issue fixed. While I want those things fixed, I am not too jazzed about a delay in our trip, no clue how long this delay may be, what our repair bill will cost or the fact that we probably are going to paying for a hotel room while this is done. 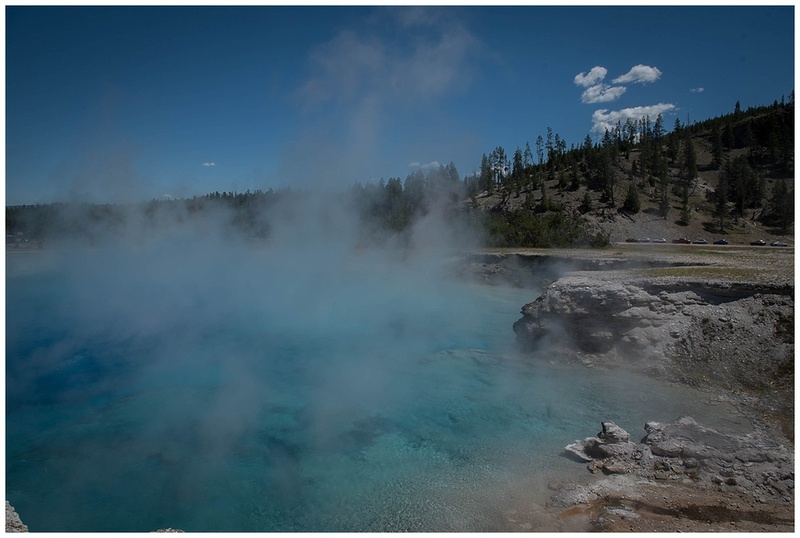 But I am trying to stay positive (which is very hard for a negative Nelly like me) and hope that our next destination of Yellowstone and Grand Tetons is all smooth sailing!!! Well we are in western Colorado now. It has been a great trip so far, with only a few little issues. We arrived in Westcliffe, CO last week and spent 4 nights at a BEAUTIFUL park. We had sweeping views of the mountains right out our back window. This campsite really was idyllic in every way. On the first day, the girls just stayed put. After all those days and hours driving across the plains, we just wanted to relax. The guys however....aka Uncle Eric and Carson....loaded up the mountain bikes and did some biking up in the Sangre de Cristo mountains. They absolutely LOVED it but definitely noticed some struggling due to the altitude. 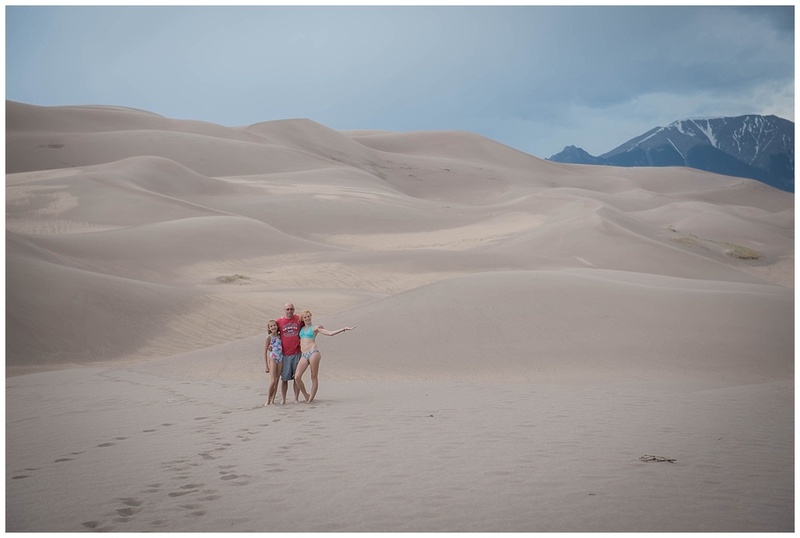 The next day we had all planned to visit the Great Sand Dunes National Park. We got on our way in the later morning, but just as we all left, I realized we forgot something. Our other party - Aunt Stacia and her kiddos - said "we will just go on ahead!". I was a little nervous about this as I didn't really have a good idea on how to get there (and I had no idea how she knew...). But we went on. I thought we would quickly catch up to Stac, but after we turned onto a VERY small dirt road and lost all cell service, we got a little worried. After quite a while, and a little scare when the GPS told us we were just driving along in the middle of a field, we started to see more houses, got some cell coverage and finally we connected with the main road again. So we immediately texted Stacia and said "Where are YOU!!!!!". The answer? "Lost in the woods". So here we are, 1 hour from our campsite, with no clue where she is (because she had no idea where she was either). And no idea what to do. So we told her to let us know when she hits a main road. We kept driving and then....lost cell service. We ended up at the Sand Dunes while hoping they would just show up. We spent a short while letting the kids run around. It is an amazing place. 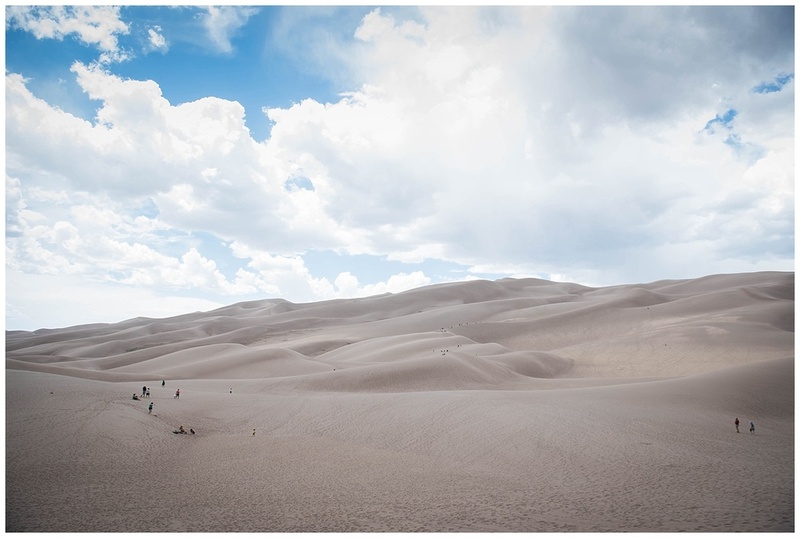 It is the tallest sand dunes in North America. There is a mountain stream that runs through that you can splash around in - although it is COLD. 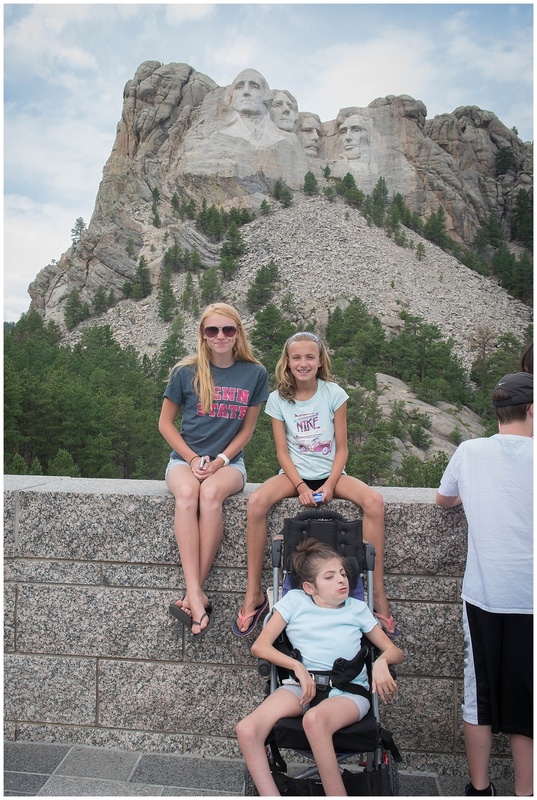 One of the nicest things is that since Caroline is permanently disabled, we were able to get an access pass where we can all get in all national parks for free. 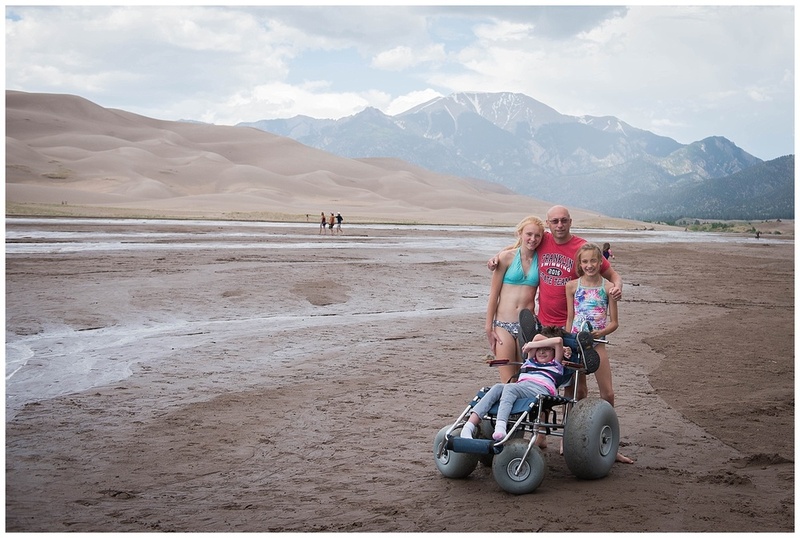 And the Great Sand Dunes had special wheelchairs available so Caroline was able to get out there with us! Although, with lots of wind, she wasn't too jazzed about the whole thing anyway, but it was still worth the trip! After we left the dunes, and got back to having cell service, we finally were able to get in touch with Stacia and found she spent the day driving around in nowhereland Colorado and then called it quits. Quite the bummer for all..... but at least everyone made it home safely. We did have some amazing views on our way home - it is crazy how it seems you can see rain somewhere around you in Colorado. Those that say PA has crazy weather are NUTS. The next day Stacia and the kids made their way for a day trip up to Pikes Peak. We opted to stay closer to "home" and Eric and the girls went to the Mission Wolf rescue. It is a place where they, well - rescue wolves! They absolutely LOVED it. They learned a lot about wolves and Christina even got a full face lick from a wolf (yuck). (This isn't Christina....but this is her photo of another person getting a little wolf lovin'." And the next day we packed up and made our way to Vallecito Lake in western Colorado. The drive along Rte 160 in southern Colorado is absolutely AMAZING. I could KICK myself for not getting more (or any?) pictures of the views. But one thing that was a little unnerving was Wolf Creek Pass. This is a steep and LOONNNGGG up and downhill east of Pagosa Springs. We decided to play it a bit safe and unhook the Pilot from the motorhome for that portion of the trip. We have been finding our motorhome struggles a bit going uphill...and we knew it would only help to have less weight for the brakes on the downhill. But I have to say....I was SERIOUSLY scared. A newish (used) motorhome, on a scary hill, with all my kiddos aboard as I trailed behind. Yeah, my palms were sweaty, my mouth was dry. Wolf Creek Pass is amazingly beautiful, but I was way too scared to enjoy it. But we made it safely up and down and it was all good in the end. Our current plan is to explore this area for a few days before making our way to northern Arizona and southern Utah. The weather changes over the last week and the next few weeks is going to be cRaZy!!!! For a reference....today it was about 70 and sunny in Colorado. And this weekend it is supposed to be about 108 in southern Utah. YIKES!!!!!!! And our trip is underway!! About a year ago, we came to a realization. We have always wanted to go on a trip across the USA. And it has always been "someday". And then we had a few acquaintances go through some very tough and scary times and it made us realize that "someday" may never happen if wait too long. We also realized that our kids are the perfect ages for such a trip, young enough to not have too many obligation, yet old enough to appreciate it. We also have a dad who is currently a teacher with a summer of vacation. But we also have a Caroline. A severely handicapped daughter who doesn't tolerate car rides for longer than an hour without getting very upset. So we bought a motorhome. A HUGE home on wheels that will allow us to tour the country AND keep Caroline happy! It was a huge and very scary investment and we are absolutely clueless on these "rigs'. So we pretty much didn't know how anything worked and have been doing it all on the fly. So we headed out 4 days ago and pretty much did quick overnights from PA to CO.
On the first day we traveled through PA, OH and IN. We set up camp in the Indianapolis area. The campground was fine - a little crowded, a little loud with interstate noise. But fine. We did have a nice view of a small pond. And we got some tumbling in, ate dinner, and slept. In the morning, Eric and my nephew Carson went to the Indianapolis Speedway to tour the museum and see the track. And we were back on the road about noon. Of course, just as we started to turn onto the on ramp to get back on I70....our storage compartment opened up and ALL our contents were thrown across the highway! YIKES! Luckily, we got them all back, but lesson learned. Just because you "lock" a compartment, doesn't mean it is completely SHUT. Day #2 we made it through the rest IN, then IL, then we crossed the Mississippi River, saw the Gateway Arch and entered Missouri! Missouri was HOT. Like almost 100 degrees HOT. And, in order to keep the entire motorhome cool, you need to turn on the generator to run the roof A/C. And we turned on the generator. And it worked. For 10 minutes. We were never able to get it to work for any length of time, so we were all very hot. Very tired. And getting very irritated. It wasn't the best moments of the trip thus far. But then we arrived in New Florence, MO and found the Lazy Days Campground. It was an oasis in the middle of nowhere. There was a POOL. There was a dog park! It was beautiful and quiet and we got two sites right next to each other. We enjoyed some Domino's delivery (WAYYY too tired to cook), sat and watched the sunset. And almost didn't want to leave! Day #3 we went through the rest of Missouri and then started in on Kansas. Holy Cow. Flat flat flat. And once you pass the halfway point, there is pretty much nothing but a few tiny towns here and there. We did some some amazing tornado damage from a storm that actually JUST came through and crossed I70 on 5/25/16. I did not even have time to grab my camera. But afterwards did some research and found it was an EF-4 tornado and quite incredible. Since no lives were lost, it didn't make the news, but apparently it was one that storm chasers will be talking about forever. But other than that, there were windmills! LOTSO windmills. We decided to really get as many miles in as we could on this day so we could reach the mountains on the next day without a ton of driving. So we drove as far in western KS we could handle and ended up in Oakley KS! Oakley has nothing. But one RV park that leaves much to be desired other than a bunch of overgrown grass and fields as far as you can see. But it had hook-ups and was an easy on/off. And only was for one night. And then began day #4. We had a bit of a late start since we were SO tired from the long drive the day before. But this day was a little more interesting since we got off the interstate and took US40 across the rest of Kansas and into Colorado. Talk about remote. The landscape was insanely flat. And, for the most part, the few homes we did see were completely run down and overgrown. We all said it reminded us of the landscapes from the movie Erin Brokovich. But we did see an antelope which was pretty cool. And then, finally we saw mountains as we headed towards Pueblo. We were getting VERY tired of driving and sitting. But once we passed Pueblo and made our way through the mountains and passed along the Arkansas River on US50...we were in AWE! Eric actually noticed some big horn sheep along this cliffside which was AMAZING! They almost completely blended in but it is crazy to think how they actually live on such steep cliffs! After a long drive of OOHS and AHHS, we turned down our final road and began traveling along the Sangre de Cristo Mountain Range. WOW. And then we arrived. And the most AMAZING RV park in the cutest little town. We knew it would be nice, but we didn't think it would be THIS nice. I am not sure we are ever going to leave. We got a campsite with unobstructed mountain views! We were ALL in awe. We feel like we are living in a screensaver. So we ate dinner, cracked open the champagne, and built a fire as the sun set over the mountains. I truly don't think it gets more idyllic than this. We are so happy with our current location that we plan to stay through the weekend and explore this area of Colorado while we start to plan our next destination!! !